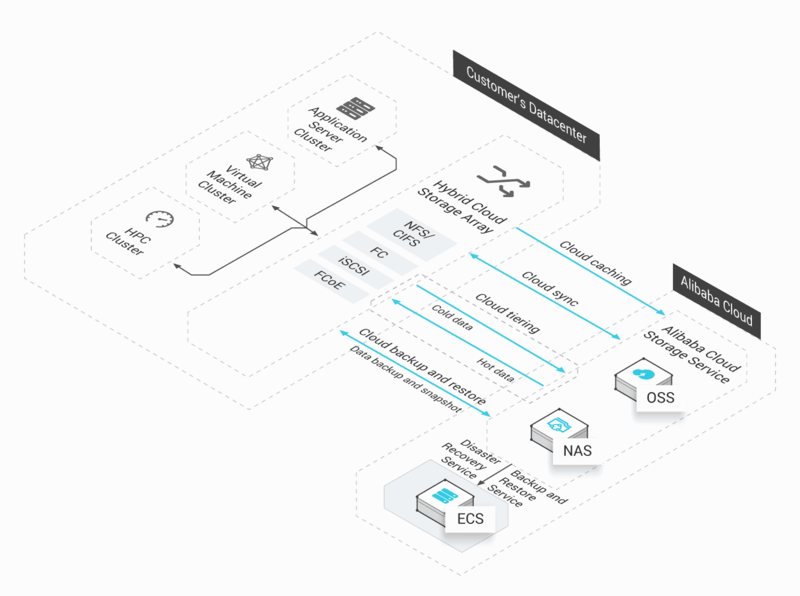 Hybrid Cloud Storage Array (HCSA) is an enterprise-level storage array that integrates with the Alibaba Cloud storage gateway. You can use and manage cloud storage resources (blocks, files, and objects) just as you would with local storage. Cloud Cache, Cloud Sync, Cloud Tiering, and Cloud Backup all make local storage migrate to the cloud seamlessly. HCSA services provide a cost-effective, efficient and easy-to-manage hybrid cloud storage solution. The devices are deployed using standard racks and have no requirements for the data center deployment. The devices support modular customization allowing seamless migration and unlimited storage space on Alibaba Cloud. The devices support dual-controller and active-active clusters. The cloud distributed storage provides 99.9% reliability and 99.9% availability. The storage system boasts point-to-point data encryption and operation logs of the devices and the services. Standard 2U and 3U rack deployment. Dual power sources are required for dual controller mode. Cinder/Swift, iSCSI, FC/FCoE, CIFS/NFS, FTP and other standard protocols. HCSA devices provide a maximum of 450,000 IOPS, and input/output capability up to11 GB/s. HCSA provides protocol conversion, cloud cache, cloud data tiering, and cloud backup. HCSA also provides data processing tools including anti-duplication and compression. Additionally, synchronous and asynchronous data transmission modes are available. HCSA supports dual-control power source, active-active, and active-passive modes. In the case that data center or hardware malfunction occurs, your data integrity is still maintained. The devices support the AES-256 encryption algorithm. MD5 checksum is automatically supported and compatible with all devices. Cloud data is 99.9% reliable and accessible. You do not need to update existing architecture or modify code. Use HCSA as traditional storage arrays, with simple configurations. The low-cost storage space allows for unlimited scalability of cloud resources. Using existing devices and cloud end Object Storage Service (OSS) price advantages to build a storage space that can be easily expandable. The same read/write experience as that of local disks, without being adversely affected by the network connectivity. Data is automatically distributed between the cloud and the local devices. Compatible with local storage service protocols, Hybrid Cloud Storage Array (HCSA) can be used immediately after simple configurations without changing any application code. HCSA builds an off-site disaster recovery solution based on a worldwide network of IDCs of Alibaba Cloud. No need to invest in an off-site physical backup data centers. Full OSS data lifecycle management is available. You can switch between OSS-Standard, OSS-IA, and OSS-Archive freely. Using ECS and cloud-based NAS, HCSA allows you to have a disaster recovery system on the cloud quickly.